Whether you have missing or failing teeth, dental implants are an ideal solution for restoring your beautiful smile — and your confidence. As your Top Rated Local® dentist in Indianapolis, Lebanon, and Kokomo, we want to help you achieve your dental goals by providing you with personalized dental implant solutions to address your concerns. Call us today to schedule a complimentary dental consultation with McCall Dentures and start smiling with confidence. Experience the Many Benefits of Dental Implants. Reduce facial sagging as a result of tooth loss. Are durable and can last a lifetime. 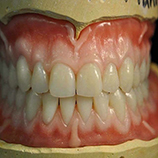 Can prevent bone loss while keeping adjacent teeth stable. A dental implant is a titanium post similar to the material used in a total hip or knee replacement surgery. The post is implanted into your jaw and can replace single or multiple missing teeth. Dental implants make a wonderful difference in our patient’s lives, so naturally, we love placing them! 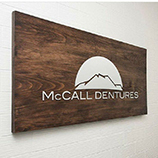 At McCall Dentures our office staff, laboratory, and doctors all work together to provide the best individualized dental implant solution you need. Our dentures can be screwed permanently into your jaw bone or the dental implants to snap your removable dentures into place. We offer complimentary consultations for all implant patients. During the consultation, our doctors can answer any questions you may have and discuss the benefits of dental implants using a team focused approach. As with any large medical procedure, we believe it is important to visit one of our caring doctors to see if you are a good candidate for dental implants. Dental implants are ideal for just about anyone who has missing or failing teeth. Our perfect candidate for dental or tooth implants is in good general and oral health. Adequate bone in your jaw is needed to support the implant, and the best candidates have healthy gum tissues that are free of periodontal disease. 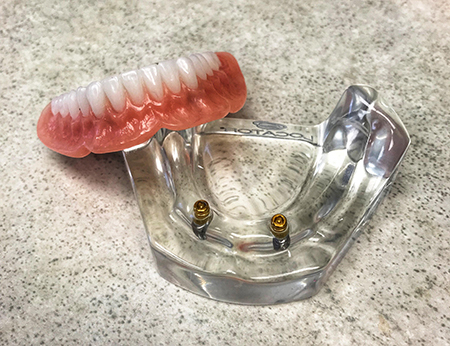 At McCall Dentures we have the knowledge, training, and facilities to create teeth that look and feel just like your own. We will continue to work with you until you are completely satisfied with your new smile. 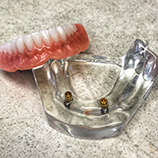 Our dental implants are typically $1099 per implant for removable dentures and slightly more for our fixed prosthetics. We are happy to offer Care Credit financing for all cases. During your free consultation, we can scan your mouth and jawbone to see how much bone is available. If unhealthy teeth need to be removed first, we can plan that prior to placement. In our on-site laboratory, our wonderful technicians personally design your implant restoration with great detail and understanding. If anything needs to be fixed — they’re always five feet away! If you think dental implants may be a good option for you, please request a complimentary consultation with the McCall Denture team. We have three convenient locations in Indianapolis, Lebanon, and Kokomo where we can meet you for a consultation to determine the best dental implant option for you. Stop hiding your smile and start smiling with confidence! Restore your gorgeous smile with beautiful dental implants that look and feel like your own teeth.